Mikaela Shiffrin, multiple alpine ski world champion and Longines Ambassador of Elegance, joined the Swiss watchmaker on March 21 to officially present her new sport watch, the Conquest Chronograph by Mikaela Shiffrin. This timepiece debuted for the first time in the United States at one of New York Cityâ€™s most iconic retail destinations, Macyâ€™s Herald Square. Mikaela Shiffrin proudly wore the watch as she greeted her fans, signed autographs, and posed for photos at the Macyâ€™s Longines shop-in-shop. The exciting event followed Shiffrinâ€™s equally exciting recent victories on the slopes as the 24-year-old skier surpassed the world record with seventeen wins in a single world cup season and won her third straight FIS Alpine World Cup Overall title. Longines was proud to time all these victories as the Official Timekeeper of the FIS Alpine Ski World Cup and FIS Alpine World Ski Championships. Longines has been actively involved in sports timing since its very beginning, and the brandâ€™s ties to the world of competitive skiing date back to nearly one century. Longines continues that tradition today as the Official Partner and Timekeeper of the International Ski Federation (FIS) and through the brandâ€™s relationship with elite athletes like Mikaela Shiffrin, whose precision and elegance in achievement exemplify Longinesâ€™ motto, â€œElegance is an Attitudeâ€�. The talented American skier has been a Longines Ambassador of Elegance since 2014. 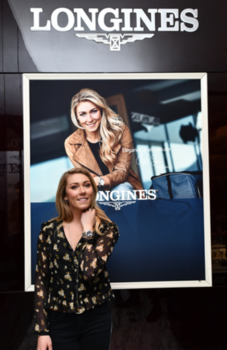 In April of 2018, Shiffrin visited the Longines headquarters, workshops, and museum in Saint-Imier, Switzerland, where she had the opportunity to personalize her own Longines timepiece. Offering a subtle blend of performance and elegance, the Conquest Chronograph by Mikaela Shiffrin reflects the bond that unites Longines and the world of sports. For the very first time, Longines presents a dial made of aventurine, a fine gemstone whose shifting colors and glitter evokes the sparkling snow cover that drapes the ski slopes carved out by the champion. The blue aventurine dial of the Conquest Chronograph by Mikaela Shiffrin, along with hints of red on the chronographâ€™s flange and hands, evoke the colors of the American flag, honoring the skier's home country. The case back of the timepiece features a special engraving that shows the racing skier's silhouette, along with Shiffrinâ€™s own signature. To enhance the sporty and technical style, this unique piece comes with a steel bracelet and a case designed specifically for the occasion, featuring the timepiece's main colors. â€œI am very honored to have been invited to Longines to learn about its rich history, its expertise, and the complex process of producing a watch last year. Having the opportunity to personalize a Longines watch and express my vision of elegance is an unforgettable experience. I hope that my fans will see some aspects of my personality in this watch, my athletic and dynamic side coupled with my own special feminine touchâ€�, said Mikaela Shiffrin. Based in Saint-Imier, Switzerland since 1832, the watchmaking company Longines offers expertise based on devotion to tradition, elegance and performance. With generations of experience as official timekeeper of world championships and as partner of international sports federations, Longines has built solid and lasting relationships in the world of sport over the years. Known for the elegance of its timepieces, Longines is a member of Swatch Group S.A., the worldâ€™s leading watch manufacturer. With a winged hourglass as its emblem, the brand has outlets in more than 150 countries.